Travis, aka Centex Travis, is a 2½-year-old brindle male born November 7, 2012. His sire is Fuzzys Cannon and his dam is Centex Zest. Travis has 14 races on record, all at Gulf Greyhound Park. He started his short career on May 25, 2014 and it ended on August 17, 2014 with a broken right rear hock. Travis had surgery on August 25, 2014 at the Dallas Veterinary Surgical Center to repair his right leg. Two screws were implanted to stabilize the bone - those may need to be removed if they ever cause irritation in the future. After several weeks of healing and rehab, Travis's leg was well healed. He was in an adoptive home for almost a year, but he has returned to look for a new forever home without any small dog siblings. Travis is not considered cat tolerant at this time, and should not live with small dogs either. He must have been a beautiful baby, cause look at him now! Travis will melt your heart with his soulful golden brown eyes. Close up you can see he has a faint white blaze on his nose and chin. Travis was a trooper while recovering from a broken leg and was determined to stay comfortable, roaching on his back on each of the dog beds. Wherever you are is where he wants to be – and if you're standing, he will be there to lean on you and stick like glue! With Travis around you are NEVER alone. He is not fond of the crate, but he will stay in one calmly if we are gone for long periods of time during the day. Recently he has earned the run of the house when we needed the crate for another foster. At night he must sleep in the same room as his humans. Travis is a vocalist! When we leave he cries a bit, and when we come home he sings a song of joy and bounces around as soon as he hears the garage door open. We put up a baby gate to make sure he doesn't try to come with us each time we leave. Travis is good with a pack and could possibly have the confidence be an only dog if given toys to keep him occupied. Travis is very food motivated so we feed him separately and keep him away until the rest have finished their meals. 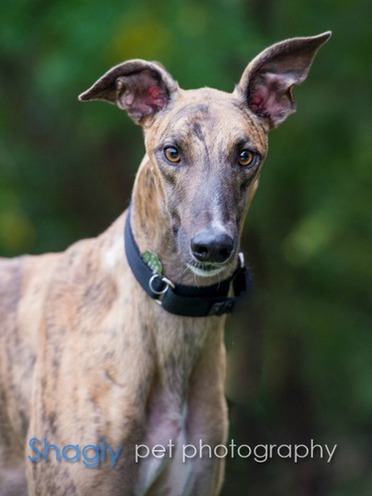 Even though he is still young, he enjoys the sedate lifestyle of an older greyhound – wake up early, go outside, eat, fall asleep, go outside, shake a toy, sleep, go outside, eat, sleep, go outside, go to bed and repeat! 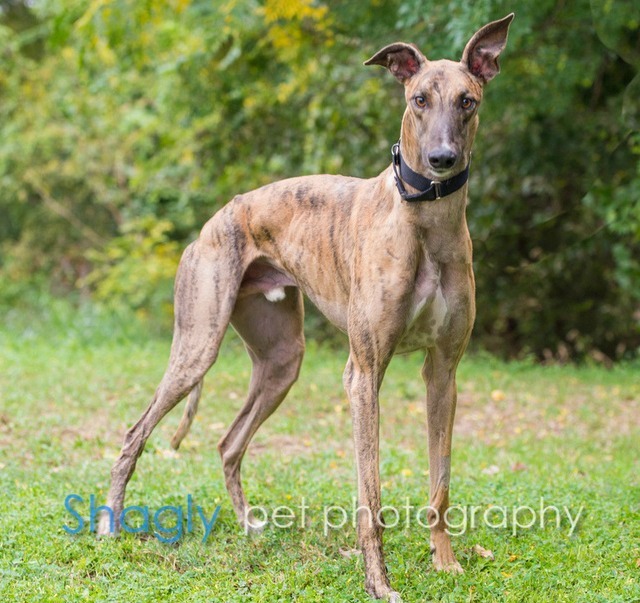 Travis is a Velcro boy and will be a faithful and loving companion to his family.